I defy anyone to put this book down before you’ve got to the end. I really mean that. There are many fantastically good books where you can break off and do other things in the middle of reading. If you have to. 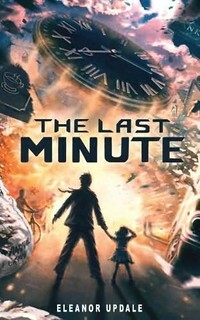 With Eleanor Updale’s The Last Minute I had to forget about doing anything I had planned, as well as telling Daughter I couldn’t talk to her on the phone until I was done. It’s a most unusual concept, featuring the last sixty seconds in the lives of the people on the High Street in a small town. Just before Christmas, just after nine in the morning, there are lots of people out doing what people do. Shopping. Having coffee. Getting buried. Picking up dog poo. Delivering the post. Chugging. Going on a school trip. Feeling happy, worried, tired or excited. Procrastinating, painting, having a bath, running, bidding on eBay. Sitting on a plane about to land at the nearby airport. Repairing the gas mains. A minute later there will be an explosion, killing many of the people you’ve just met and got to know so well, in their everyday worries and concerns. The prologue ‘helpfully’ shows the reader what has just happened, leaving no illusions as to the possibility of a happier outcome. The Last Minute shows a realistic cross-section of life in Britain today, and most of us will recognise ourselves in one or two of these people. I won’t call them characters. They were always people. A little reminiscent of Under Milk Wood in the way the story darts between all of them, except faster. It’s amazing the number of actions and thoughts we can cram into sixty seconds. Just writing about it has my heart rate going all over the place. This entry was posted in Authors, Books, Reading, Review, Thriller and tagged Eleanor Updale. Bookmark the permalink. Is it an adult or children’s book? Premise sounds adult, cover looks children. Don’t suppose it really matters, but am excited by it and want to know what to expect from the themes etc. I don’t think Ellie writes books that are easily age-categorised! She breaks rules brilliantly. Not every single person dies. You keep hoping most won’t, and thinking that some almost deserve it. But because of the prologue, you have no silly hope and you are certainly not taken unawares. Elen, yes, I wondered about this. Ever diligent (!) I asked both Eleanor and David Fickling (who I think of as purely a children’s publisher). It’s an easy read. Very light, considering the topic. There ARE children in the book, but it is primarily adults. And primarily their thoughts. I think children the right age, i.e. not too young, would not stop to think about it. And it might do them good to find that adults have their own thoughts, and that Mum wasn’t being horrid for the sake of it. She has a tough existence. Odd – I wrote a comment but it seems to have vanished. I was saying: I’ve got a proof copy and am dying to read it. Had to delay as have compulsory stuff to read first. I think it sounds like a GREAT premise. No, you didn’t disappear. You commented on Elen’s bit further up. Read as soon as possible, though. It sounds like the opening to DOMAIN by James Herbert, which features a wonderful series of vignettes of people’s lives around London in the moments leading up to a nuclear strike. It’s a great intro to a novel and sticks with me to this day, twenty plus years since I read it, as a tremendous book intro. Interesting to see a similar premise being expanded into a full book. I’ll be reviewing it on Jan 4th. on ABBA reviews. I loved it too…I reckon it’s a YA book with crossover for adults. Very well-plotted and yes, as Bookwitch says, unputdownable. Very crossover. Just not sure in which direction. Does anyone know if this is released in the US?